My fifteen minutes of fame came as a character in Jeffrey Archer’s latest installment of the Clifton Chronicles – Mightier Than the Sword. Rarely do I enter contests; even more rarely do I win one – yet, Jeffrey Archer picked me. My prize – my name as a character in his next book – Mightier Than the Sword. Although I was hoping to be the evil mastermind, my namesake is a minor character appearing only briefly but consistently. Maybe you can find it – if you don’t blink. If you are a fan of the Clifton Chronicles, you are primed to expect adventure and sabotage, connecting the network of established characters in the Barrington and Clifton family trees. Harry Clifton uses the book’s opening bombing incident on his wife’s new ocean liner as fodder for his latest successful spy thriller, and remains true to his moral compass as well as his penchant for crime solving, as Archer weaves Harry into a Russian undercover plot to suppressing state secrets reminiscent of a Solzhenitsyn exposé. Emma, Chair of Barrington Shipping Company, faces her own issues with old nemesis Virginia, beautiful ex-wife of her brother Giles. Sebastian, son of Harry and Emma, now a young handsome finance wizard, had my undivided attention, since he is the character who interacts with my namesake – on more than one occasion. 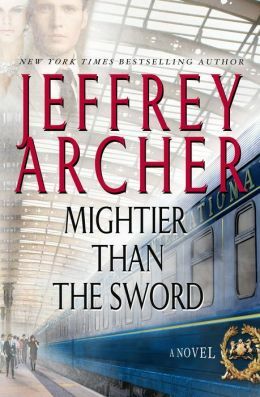 More characters reappear, but Archer carefully provides background for anyone who has not read the previous books in the series. If you are a new fan, you might consider starting at the beginning with a binge-read, saving yourself from the angst of the inevitable cliff-hanging ending. Reading an Archer novel is like watching an episode of your favorite television series. The plot twists are usually surprising, the villains sometimes win the battles, the heroes are vulnerable, and satisfying solutions usually prevail. I dare you to not read the books quickly as I do, furiously seeking the next outcome. Maybe in the next installment, Dr. Rosemary Wolfe will return and play a bigger role in Sebastian’s life – I hope so. This entry was posted in authors, book review, books, reading and tagged adventure, Aleksandr Solzhenitsyn, Barrington shipping, family saga, fifteen minutes of fame, Harry Clifton, Jeffrey Archer, Mightier Than the Sword, Ocean liner, Soviet Union, The Clifton Chronicles. Bookmark the permalink. When expected release date for Clifton Chronicles #6? The Clifton Chronicles will continue with a sixth book coming out in 2016. That is SO COOL, Rosemary! I can’t wait to read about you as Dr. Wolfe! I guess I’ll have to start at the beginning and read all the books in the chronicles so I know what’s going on, which will be hard. I’m tickled that you are now even more super famous! The books are fun and fast; I like to read them on long plane rides, but couldn’t wait on this one.